Entrance Hall - staircase to first floor, radiator, double glazed UPVC front door and sidelight. Lounge - 4.22m x 3.55m (13'10" x 11'8") - open fire in stone fireplace, radiator, windows to front and side, opening through to Dining Area. 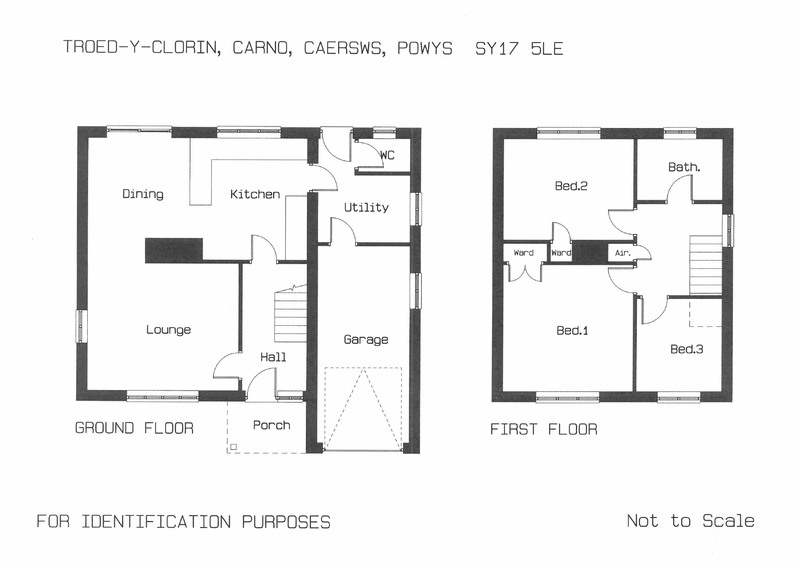 Dining Area - 2.90m x 2.91m (9'6" x 9'7") - radiator, patio doors to rear garden, opening through to Kitchen. Kitchen - 3.37m x 3.08m (11'1" x 10'1") - fitted base and wall units with work top surfaces, stainless steel sink unit, tiled splashbacks, integrated electric oven, built-in ceramic hob with extractor over. Utility - 2.57m x 1.88m (8'5" x 6'2") - storage units with work tops, Belfast sink, gas central heating boiler, plumbing for washing machine, door to garage, rear entrance door. Separate Wc - with tiled walls. Landing - access hatch to loft, airing cupboard, window to side. Bedroom (1) - 3.64m x 3.54m (11'11" x 11'7") - built-in wardrobe, radiator, window to front. Bedroom (2) - 3.64m x 2.81m (11'11" x 9'3") - built-in cupboard, radiator, window to rear. Bedroom (3) - 2.56m x 2.41m (8'5" x 7'11") - built-in bed and storage units, window to front. Shower Room - 2.35m x 1.70m (7'9" x 5'7") - quadrant shower cubicle, wash basin and WC set in units, tiled walls, extractor fan, heated towel rail. Outside - Spacious grounds comprising tarmac parking area for several vehicles, large lawn areas to front, side and rear with flower beds and a variety of shrubs and ornamental trees. Integral Garage - 5.58m x 2.44m (18'4" x 8'0") - metal up and over door, power and light, internal access door from Utility. N.B. The services, flues and appliances have not been tested and no warranty is provided with regard to their condiiton. Council Tax - Band 'D' (online enquiry). Directions - From Newtown proceed on the A489 towards Llanidloes, after 6 miles and before the level crossing turn right signposted Caersws A470. Continue through Caersws, Pontdolgoch and Clatter to the village of Carno. On entering the village continue past the Primary School on the left and after this take the second turning on the right hand side before the shop into the small cul-de-sac and Troed Y Clorin is the first house on the left hand side. Website - To view a complete listing of properties available For Sale or To Let please view our website www.morrismarshall.co.uk Our site enables you to print full sales/rental particulars, and arrange a market appraisal of your property.